BDB is the world's leading specialist b2b marketing communications agency working only with b2b focused companies. With 27 years' experience running global b2b marketing campaigns, our BrightTalk channel is home to expert advice and best practice in b2b marketing communications. 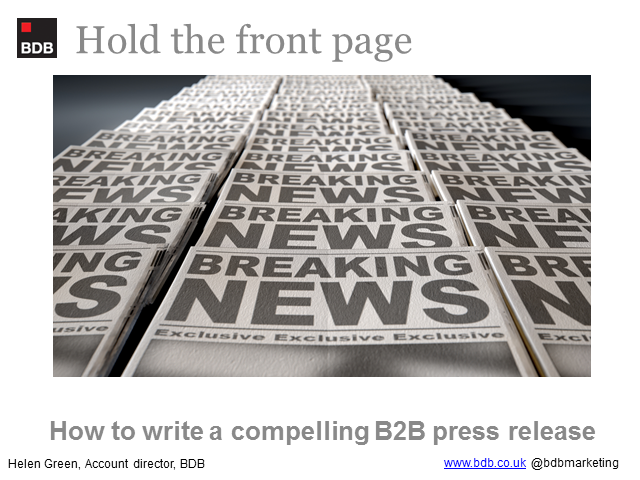 Helen Green, Account Director at BDB, will be giving her top tips on how to write a compelling b2b press release and how you can increase the impact and maximise the coverage of your news by following some straightforward steps. The latest advances in online tracking give b2b marketers access to a wealth of data that can be used to analyse the success of marketing communications campaigns. Yet in reality it is often a case of information overload, and in many cases the ready availability of digital analytics has resulted in higher expectations at board level when it comes to justifying spend on PR and other offline marketing tactics. In this new webinar, Jenny discusses how b2b marketers should measure success on an ongoing basis as part of a culture of continuous improvement. She first looks at the theory behind evaluation and progress in the global PR industry since the Barcelona Principles were published back in 2010. She then gives practical examples as to how time-poor b2b marketers can start to implement best practice evaluation within an organisation, with a particular focus on measuring the success of integrated campaigns. Louise and Rachael will provide tips on how to develop a great digital strategy and engaging content in an international b2b context. Neil will be looking at tips and examples of best practice in b2b content marketing. Life Sciences & Health Director Dr Catherine Butcher will guide you through the key considerations when communicating complex scientific and technical information. BDB's Digital Project Manager will be looking into the crystal ball to preview some of the important digital tools, techniques and approaches that progressive b2b marketers should be considering as part of their 2015 marketing communciations programmes. This session will uncover a systematic seven step approach to delivering better international b2b marketing campaigns. This session will explore how some of the primary social media channels can be harnessed more effectively for b2b brand engagement and marketing conversion.